Address : 11-01, Jalan Bestari 8/2, Taman Nusa Bestari, Nusa Jaya, 81200 Johor Bahru. The Johor Bahru Regional Centre is located at Nusa Jaya, Johor Bahru and is nearby shopping malls, offices and housing areas. 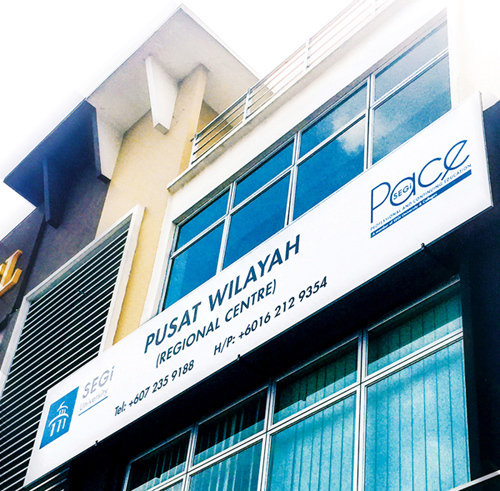 The Centre was recently refurnished to provide working adults in the Southern region an avenue to study and to network via SEGi PACE programmes. Since 2011, the Centre also serves as the regional hub for SEGi programmes in the Klang Valley. It offers student registration support, student accommodation and counselling services for secondary school leavers and working adults who seek advice for full-time studies at any of our SEGi campuses in the Klang Valley. SEGi scholarship applications can also be done at the Centre. As a regional centre for the state of Johor, we are committed to support students to realise their full potential and to achieve their goals.